The pages of the Central European Summer School in Generative Grammar tell you about the whole event, and also link back to all previous schools (since we use the web). Phonology pages of the Nis Summer School. Content: Haike Jacobs (course abstracts), Jonathan Kaye (abstracts & articles), Tobias Scheer (handouts, articles), Sabrina Bendjaballah (handout). In July 2006 I taught at the 4th New York-St. Petersburg Institute of Linguistics, Cognition and Culture. content: handouts, assignments, test, articles, material on Slavic (Polish & Czech). pages of these classes. Content: handouts, articles, material on Slavic (Polish & Czech). the introductory part of the file below provides detailed explanation regarding the goal and scope of the corpus, how it was constructed, how it is organised, what you can do in order to improve it and where it has been used. UCL Working Papers in Linguistics, everything since No 8 (1996) for free ! SOAS Working Papers in Linguistics, vols 8 (1998) and 9 (1999) free for download, but not the more recent ones (4-7-03). BWEARE: this seems to be a dead-end now (20-2-04): all the Working Papers pages have been removed (temporarily?) from the server. The Restrictive Phonology Research Group based in Japan: Phillip Backley, Kuniya Nasukawa and Toyomi Takahashi. A lot of papers to download. John Harris' hompage, a host of papers waiting to be downloaded, and course material. Eugeniusz Cyran's hompage, under construction (2-06), for the time being only a list of his publications avaiblable, some items of which can be downloaded. Stefan Ploch's hompage, where you can download his papers (downloading Ploch...). John Rennison's hompage, one paper ready for download (4-7-03), and the usual personal information. Sabrina Bendjaballah's hompage, where you can download 4 papers (20-2-04), and the usual personal information. Jean Lowenstamm's hompage, four papers ready for download (20-2-04), and the usual personal information. Gilles Boyé's hompage, four papers and his Ph.D (2000) ready for download (20-2-04), plus the usual personal information. Wiebke Brockhaus' hompage, no papers to download (4-7-03), but a list of her publications and the usual personal information. Emmanuel Nikiema's hompage, one paper ready for download (4-7-03), and a list of his publications, plus the usual personal information. 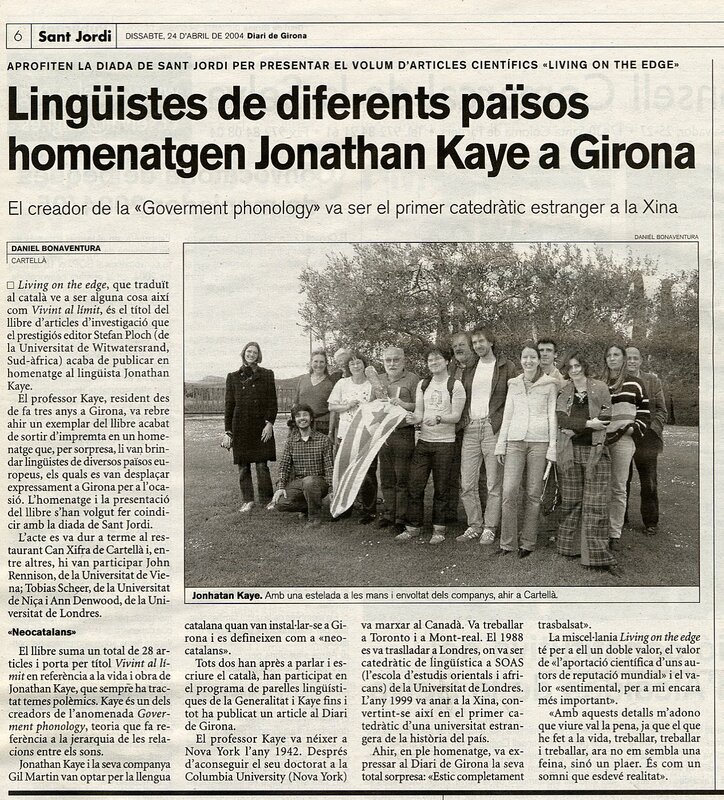 A Festschrift for Jonathan Kaye has been published in December 2003 at Mouton. On April 24th, 2004, some friends and colleagues of his have gone dwon to Girona/ Catalunya where Jonathan lives in order to give him a copy - he was not aware that the book exists. The local newspaper has published an article about the event (in Catalan), including a picture. You can download it here.